Welcome to St. Mary's Home! 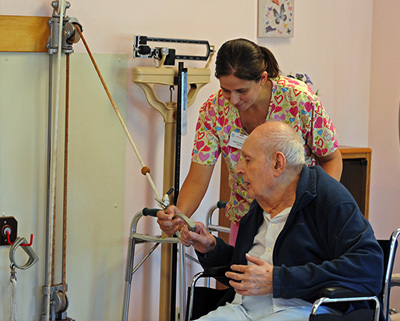 St. Mary’s Home – Intermediate Long-term Care: A walk through our front doors allows even the casual observer to feel the home-like atmosphere. We provide private rooms for 76 Residents who share meals in our community dining rooms, join in daily social activities and field trips, and benefit from our caring nursing staff who are available 24/7. Jugan Terrace – Independent Living Apartments: Named in honor of St. Jeanne Jugan, the Terrace accommodates needy elderly who are able to maintain an independent lifestyle. Our 50-unit apartment building provides generous space for these Residents including a bedroom, separate living/dining room, kitchen and bathroom at a cost far below average rents in Chicago. 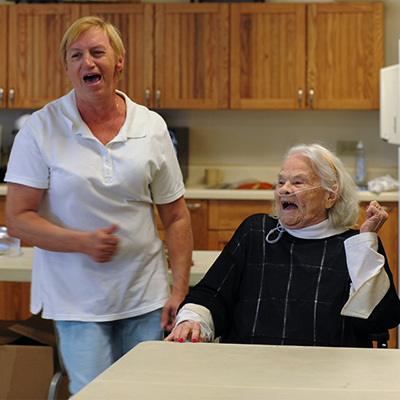 Senior Center – St. Mary’s also offers a day program for the elderly in our neighborhood. All are welcome to join our other family members for meals, recreational and social activities, leisure time activities and spiritual services. What makes St. Mary’s Home unique? The Sisters’ love is at the heart of their service. The Little Sisters strive to create and maintain a place where all are treated equally and with love. They inspire the wonderful spirit which radiates from every corner. It is a true home, not just a place to live, work, or volunteer. The Staff are truly an extension of the Sisters' hands and hearts. The gifts they bring to their duties are what helps us maintain our Family Spirit. Benefactors have been a vital and treasured part of our family. Without their generous support, we would not be able to meet the operating costs of the home. Volunteers have reached out their hearts and heads in service to lighten the Sisters’ task in meeting the many needs of the aged.